As a freelancer, the best way to secure your business is through a freelance client contract. Crafting a contract for your clients before the projects start has many benefits. For starters, it lets you negotiate effectively. Through contracts, you can clarify your responsibilities and how you’ll be compensated. But contracts don’t only protect your interests. They benefit your clients as well. Agreements help build trust and confidence. They give your clients a clearer picture of what they should expect from you. Contracts give them a peace of mind because they know where their money is going. In a nutshell, freelance contracts make working relationships better and help prevent misunderstandings. This week on Five Tips Tuesday, we’ll help you create effective freelance client contracts. Learn how to look for red flags in business contracts. Avoid the common mistakes most freelancers do in making them. Discover how to write a strong agreement. Find out if digital photography contracts are ideal for you. Lastly, get the book that will help you understand contractual agreements better. Many freelancers don’t pay too much attention to their contracts. They often miss the important terms before they sign. This can cause serious problems if not properly taken care of. Learn how to look for the red flags in business contracts here. As a freelancer, one of the crucial things you have to do is draft your own business contracts. But are you doing them right? Read this article and find out the common mistakes in writing freelance agreements. Creating a solid freelance contract might seem complicated, especially for first-timers. But writing an effective contract is not as hard as it seems. You don’t even need a lawyer to start making them. Here’s how you can create an excellent freelance contract. For photography businesses, digital photography contracts are cost-effective means to help your business stay afloat. Take a look at this infographic and learn more about digital photography contracts. Navigating the world of contractual agreements can be overwhelming, especially to nonlawyers. “Contracts: The Essential Business Deck”, aims to solve that problem. This book is a must-have for business owners. It has easy-to-understand explanations for every common contract term. It also includes negotiating strategies, up-to-date explanations of electronic contracts, and tips on modifying agreements. 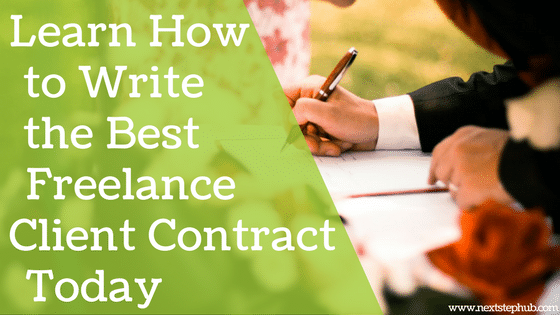 How do you write your freelance clients contracts? Do you have more tips to add? Tell us in the comments!